I recently took a drive through an area know as Santiago Canyon, which lies just outside of the fully developed and soon to be overpopulated Irvine California. The most frustrating thing about growing up in Ohio and living in Southern California for me is how difficult it is to distance yourself away from the things of man, to find a quiet, peaceful place within dear Mother Nature. Call me a treehugger, hippie, whatever you wish, but its these type of landscapes that have always calmed my soul, and unless you've been exposed to easily available open space, I'm afraid you wouldn't understand. 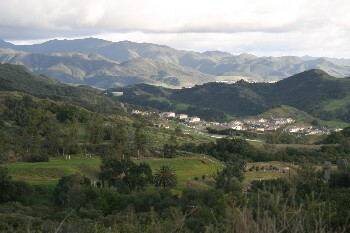 Santiago Canyon has some of these qualities, solely for the fact that its a canyon and many of the areas are unbuildable, it provides a nice contrast to the traffic ridden streets of the rest of Orange County. Unfortunately however, I soon came across a site that disappointed me, and raised questions about the longevity of the natural beauty that is hanging on for dear life. The dissappointment: Falcon View Estates. A suburb, made possible by cutting down every tree that could possibly of housed a falcon's nest and carving and flattening the canyon hillside in order to build tract homes that look no different then any other of the suburbs I passed on my way. 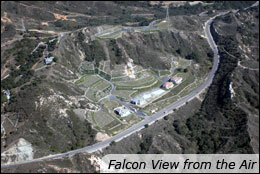 What I don't understand, and I've seen this phenomenom across the US, is the sad attempt to reclaim the Genus Loci, or sense of place, of an area by simply putting up a sign that names the suburb after the character the site possessed before it was destroyed by the construction, hence "Falcon View". Giant Olive Trees that provide shade and wildlife (hey, maybe even a falcon!) are removed to provide maximum amount of housing space to increase the developers profit, and new, smaller trees are brought in to one day attempt to provide which once existed. Streams and creeks are damned and filled, and replaced by rubber-lined fountains within the confines of ones backyard, again, an iconic version of what was given to us naturally. I hope I'm not coming across as a bantering environmentalist, I just want to encourage all of us as community members to understand the intrinsic value of our environment cannot be recreated, and if attempted all of our communities eventually become water-downed versions of the real thing, blending into neighborhoods that no matter which part of the country, only differ in name. Our population is growing, and new homes are undoubtedly a necessity, so don't mistake my rambling for total preservation. But as knowledgeable citizens, we have a voice in the approach that developers affect our surrounding environment, and with careful and creative planning, we can all live in more harmonious way within our natural environment, preserving at least a sense of place that hopefully our children and grandchildren can enjoy as we did. I'm anxious to hear your thoughts, experiences, and comments regarding suburban development.